This is like building a boat backward," James Moores says as he surveys the peeled-back hull of the former presidential yacht Honey Fitz. 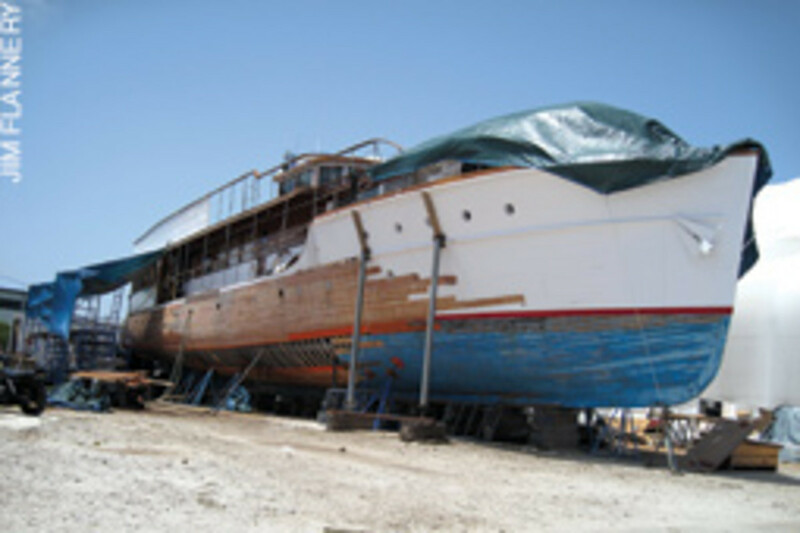 The wooden 93-footer, a yacht for five presidents, is showing her 79 years as she sits on the hard at the Riviera Beach Yacht Center, where Moores&apos; carpenters are replacing her double-planked cedar hull with virgin Douglas fir - elegant vertical grain on the topsides, slab-cut fir below the waterline. "I never had the nerve to dream this big," says Moores, 55, who does wooden-boat restorations at yards in Riviera Beach, Fla., and Beaufort, N.C. "But I&apos;ve always wanted to do historically significant boats. They&apos;re at the pinnacle of history. They have elegance, styling, classic lines. Once they&apos;re gone, they don&apos;t come back." Moores has had a good run of historically significant boats lately. Honey Fitz, designed by Tom D. Bowes, was built in 1931 at the Defoe Boat and Motor Works in Bay City, Mich., as a commuter yacht - Lenore II - for Sewell Avery, chairman of Montgomery Ward. 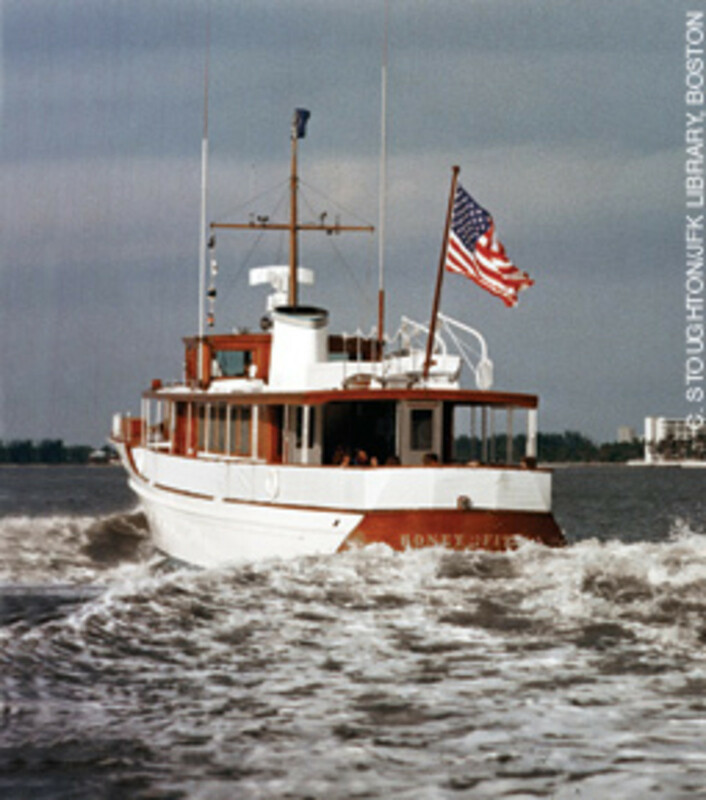 It was refit during World War II for service as a coastal picket and a training boat for submarine crews, and in 1954 was converted to a presidential yacht - Barbara Ann - for Dwight D. Eisenhower. 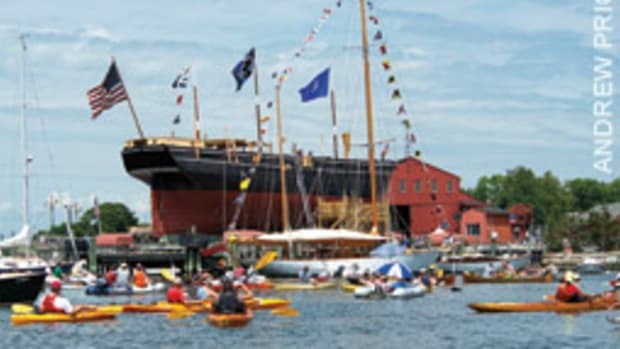 Moores, who has specialized in restoring Trumpies, also did an $8 million plank-by-plank rebuild of Summerwind, a 1929 100-foot John Alden schooner, for oilman J. Don Williamson, who donated the yacht to the U.S. Merchant Marine Academy. Moores also refastened the bottom, put in new ribs, and replaced the engines and drivetrains on Justice, a 71-foot Consolidated commuter built in 1930. 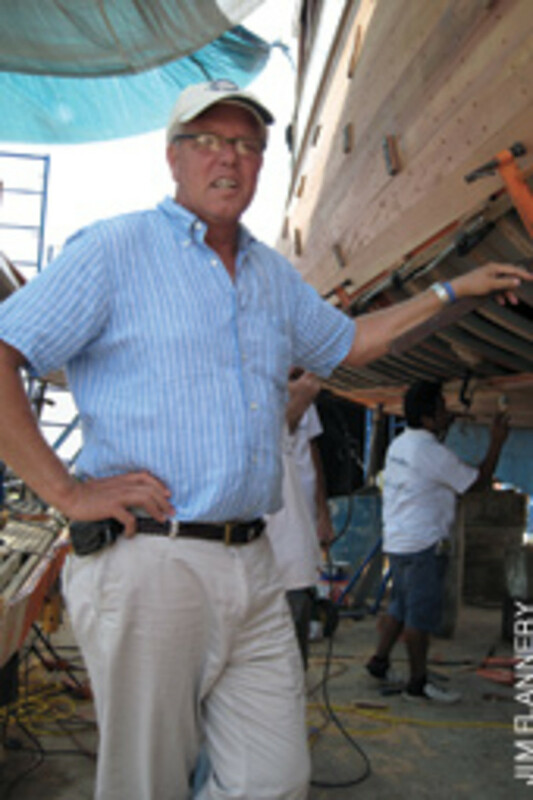 Moores figures he has undertaken about 100 major wooden-boat projects since he opened his shop in Florida in 1986 (www.woodenboatrepair.com), but the Honey Fitz is his most prestigious project - and one of the most challenging. "This is no easy work," he says. "This is tough stuff." Honey Fitz&apos;s hull was twisted. Her bow had rotated 15 degrees to port and dropped 6 inches from midships forward. The stern had rotated 4 degrees to starboard and dropped about 3 inches - a condition known as hogging. "We had to find a way to adjust the boat - be a chiropractor," Moores says. Metal pipes running from the ground up lifted the engine beds and deckhouse and held them in place. Ribs, planks and stringers were disassembled; bilge wood was soaked so it could be realigned; new ribs were laminated in place; and the boat was jacked and blocked to untwist its bow and stern. "Now the boat is straight," he says. He knows that because he has used plumb bobs, lasers and digital levels to check and recheck for drop or twisting in the hull. His carpenters are replanking Honey Fitz with two layers of Douglas fir - an inch thick on the outside, a half-inch inside. Moores says the fir is a little heavier than the original cedar, but is stronger and better able to withstand the weight that has been added to the yacht since she was built. Moores expected the replanking to be finished early this year, but he hopes that won&apos;t be the end of the restoration. The eighth presidential yacht, Honey Fitz served Harry Truman, Eisenhower, John F. Kennedy, Lyndon Johnson and Richard Nixon. 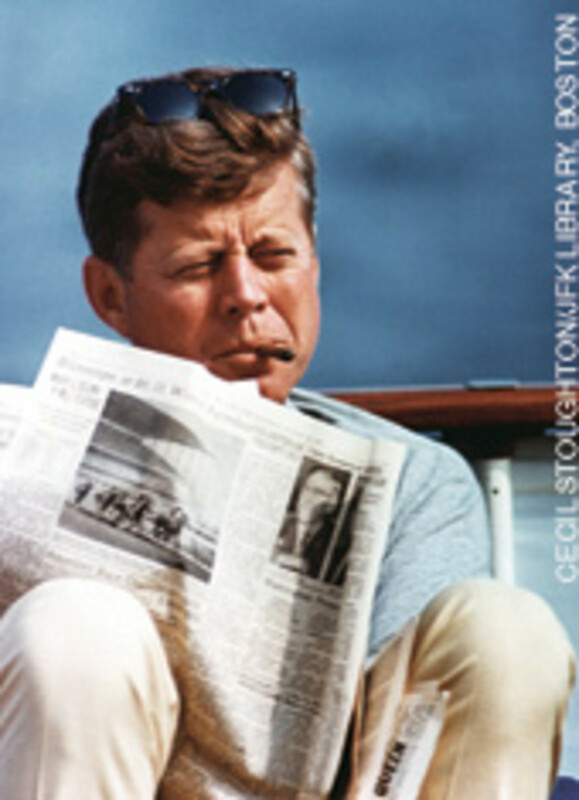 She is most closely identified with Kennedy, a sailor who would use it with his family off Newport, R.I., Cape Cod, Mass., and Palm Beach, Fla., to find relief from the relentless pressure of the White House. 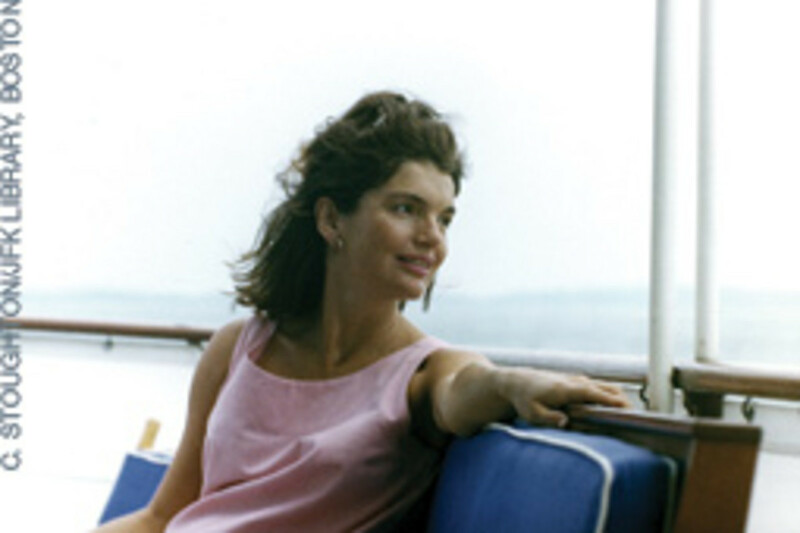 Known as "The Yacht of Camelot," Honey Fitz became recognized worldwide from the iconic photo of the young president sitting in the cockpit with his daughter, Caroline, curled up in a blanket and leaning on his shoulder. Kennedy named it Honey Fitz after his maternal grandfather, John Francis "Honey Fitz" Fitzgerald, mayor of Boston. "She is a national treasure," Moores says. "The owner of the boat [Texas oilman William M. Kallop] is a wonderful man. He sees himself as the caretaker of the boat." Kallop&apos;s father and JFK were freshmen together at Princeton University. Moores says he is on his fifth contract with Kallop and has done less than $2 million worth of structural work on Honey Fitz. A full restoration, if Kallop asks for it, probably would cost a couple of million dollars more. "He&apos;s planning on keeping this boat," Moores says. 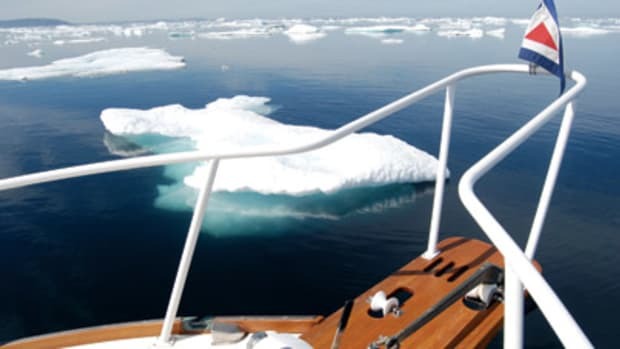 Although the yacht, with a new hull, will be certified by the Coast Guard for charter, "as far as I know at this point, it&apos;s going to be his personal yacht," he adds. Moores would like to see the boat restored to the condition it was in around 1954, which would involve removing the aft cabin, taking the handrails off the cabin top, restoring the original exterior trim and redoing the interiors to their Kennedy-era look. In her day, Honey Fitz was cutting-edge, and her efficient design remains impressive. The hull, of steel and wood, was light but strong. With her lightweight twin 500-hp Winton diesels, long bow and narrow, wave-piercing forefoot, Honey Fitz revved up to 24 knots on her first sea trial. "At 93 feet, that&apos;s incredible, and it&apos;s all old-school technology" Moores says. A June 1932 article in Yachting magazine about Lenore II describes the benefits of the new lightweight diesels and a new kind of hull framing. The framing is composed of a backbone of four steel keelsons, or beams, with holes cut in them to reduce their weight. They run the length of the vessel and - along with some steel bulkheads and floors - provide stiffness and a strong frame for securing the powerful diesels. "Around the outside of this steel skeleton are worked the wooden frames and double planking, and to fasten the frames and deck beams together a very strong tie was devised," Reginald Crowly wrote. The result: "Twenty-four miles an hour for 24 hours at a cost of about $3.50 an hour in a 90-foot hull with three double staterooms and two saloons, costing complete about $100,000," which Crowly thought a steal. Rated for "coastwise" use, Lenore II would require no more than five crewmembers instead of 30, as many behemoths of the time required. "In a yacht of the type of Lenore II, one can leave New York at midday and reach Narragansett Bay before seven," Crowly writes. "From Chicago, one can make Mackinac Island in 15 hours. The run from San Francisco to San Diego becomes a matter of 21 hours. 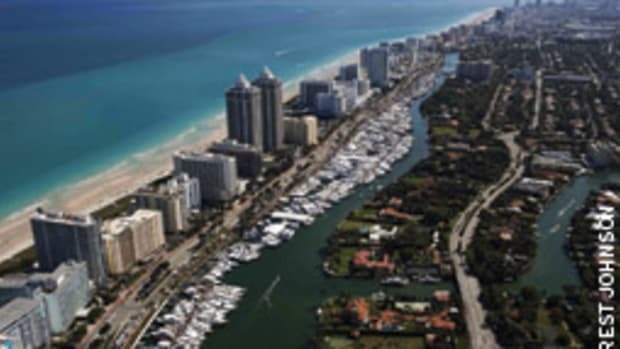 Miami can be reached out of New York in a little over 50 hours, with one refueling." The yacht is ideal, he writes, for businessmen "who lack time to make ocean passages or extended cruises" but need a quick getaway. 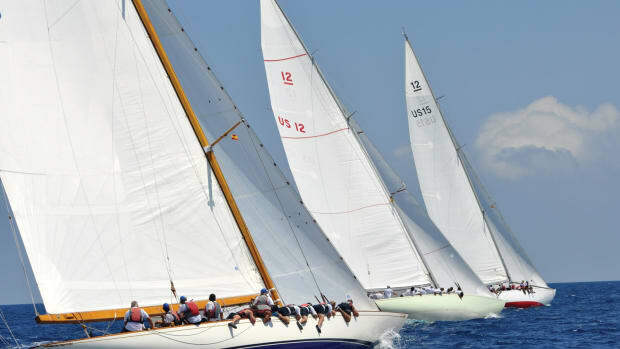 Moores is fond of the post-World War II generation of wooden yachts that followed Lenore II because they benefited from fast-boat technology that was developed during the war. "These boats are fast, they are light, and they are skinny," he says. After her own stint in the war and shortly after Franklin Delano Roosevelt&apos;s death in April 1945, Honey Fitz was transferred from the Coast Guard to the Navy and briefly served as a tender to the USS Potomac, Roosevelt&apos;s 165-foot "floating White House." Truman used her mainly as a tender for the lavish 224-foot presidential yacht Williamsburg, according to reference material from the John F. Kennedy Library and Museum in Boston. Eisenhower, who considered Williamsburg a "symbol of needless luxury," dumped the big yacht after Congress complained about the maintenance costs. He refit Lenore II as a bona fide presidential yacht, often using her as a locker room for changing out of his golfing togs while crossing Rhode Island&apos;s Narragansett Bay from the Newport Golf Club to his Newport home. Kennedy was on Lenore II - at this time renamed Honey Fitz - probably more than any president, using it mainly for getaways with family and friends almost every weekend in the summer, when he was at the family compound on Cape Cod, and less often in the winter in Palm Beach, according to the Kennedy materials. Moores found the original plans for Honey Fitz at Bowling Green State University in Ohio, and he considers it a privilege to restore the legendary yacht. He says he has worked his way up to projects such as this during 35 years of wooden-boat repair and that he is always learning because every project presents new challenges. "Every day we&apos;re dealing with a new set of issues," he says. A son of the Midwest, Moores grew up in Indianapolis in a family that was in the lumber business. His father, James Phelps Moores, was a lumber broker. As a youngster, Moores used to go down to the train yards with his father to count and inspect rail cars of lumber from all over the Midwest. But he says he wasn&apos;t so much interested in lumber as in fixing things. 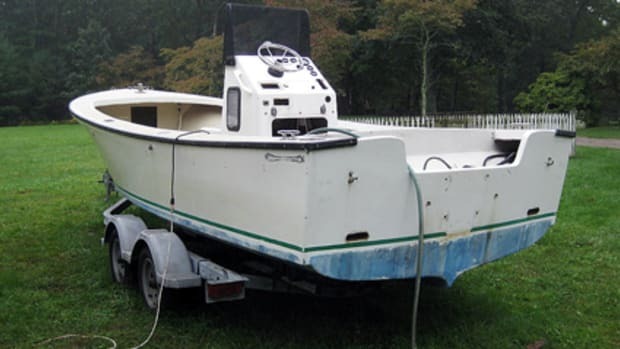 He took the family stove apart and repaired it, and he became intimately familiar with the construction of the family&apos;s wooden Lyman ski boat as he fixed this or that on it. By the time Moores was ready to leave home, he knew he didn&apos;t want to go into the family business and didn&apos;t want to go to college. 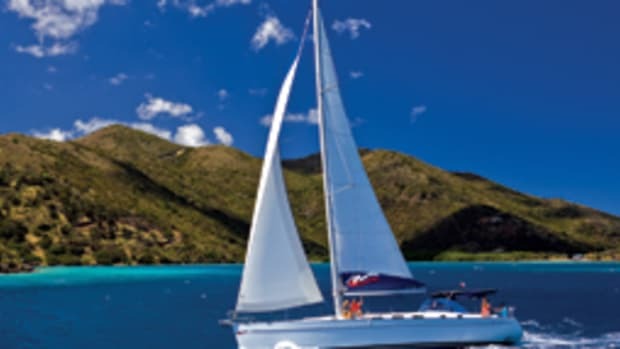 He used his college money to buy a sailboat and cruised to the Caribbean, where he helped build his first wooden boat - a replacement for a stolen inflatable dinghy. In Dominica, he asked around for the best boatbuilder and was steered to Mu-Mu, a deaf and mute islander. Moores helped him build a 12-foot wooden skiff, which lit a fire that has burned for more than three decades. Moores sailed to Maine, apprenticed himself to some builders there and eventually bought a shop of his own, R.S. Colson Boat Works, one of the country&apos;s oldest, founded in 1886. He built weir boats - stable powerboats - for Canadian commercial fishermen, who bought them as replacements for the rowing boats they used to tend their staked-out nets. Moores says it was a good business. He developed his own design and made a name for himself, but he wasn&apos;t a particularly good businessman at the time. The business failed during the economic malaise of the 1970s. Moores says he moved to Florida in 1981 with scarcely more than his tools, his pickup truck and the clothes on his back. 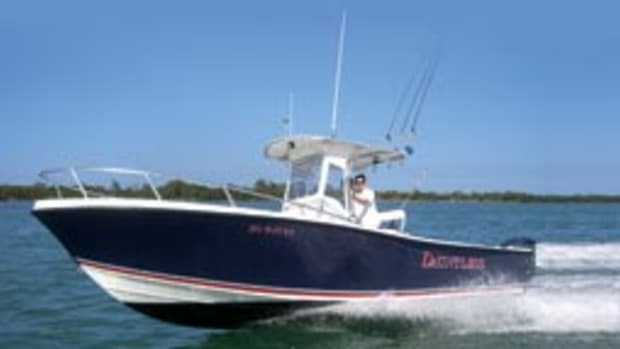 He was on food stamps just long enough to get a job working on a 55-foot Chris-Craft owned by John Murphy Sr., one of the owners of Cracker Boy Boat Works in Riviera Beach. Moores worked at Cracker Boy for five years and opened his own shop in Riviera Beach in 1986. 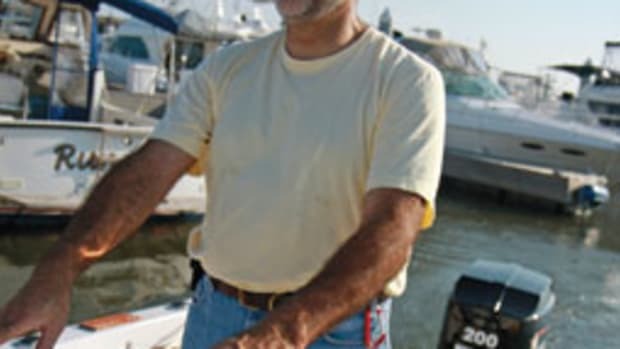 In 2007, he opened a second location, the 18-acre Moores Marine Yacht Center in Beaufort, N.C., to service boats that make the annual run north and south on the Intracoastal Waterway, he says. Like his dad&apos;s lumber business, Moores Marine is a family business. Moores runs the Florida yard, his brother-in-law Nathaniel Smith runs the Beaufort yard, and his wife, Stephanie, is the company&apos;s chief financial officer. Moores says both yards specialize in wooden-boat repair, and both employ 10 to 12 people, even in these tough times. "We&apos;ve had some bumps, but at the same time we&apos;ve been very blessed," he says. "My wife says, &apos;It&apos;s only taken 30 years to become an overnight success.&apos; "
If a class of boats could be like a dynastic royal family, the 12 Metre Class would qualify.